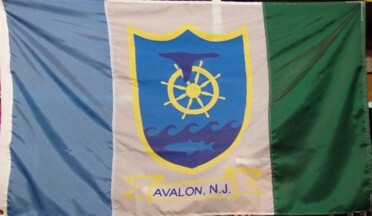 A light blue-white-green vertical tricolor (white stripe slightly wider) bearing a yellow-rimmed medium blue shield with a yellow ship's wheel above five dark blue waves. Over the wheel is a dark blue goose flying, and over the waves is a medium blue fish. The borough name is printed on a yellow-bordered white ribbon below.